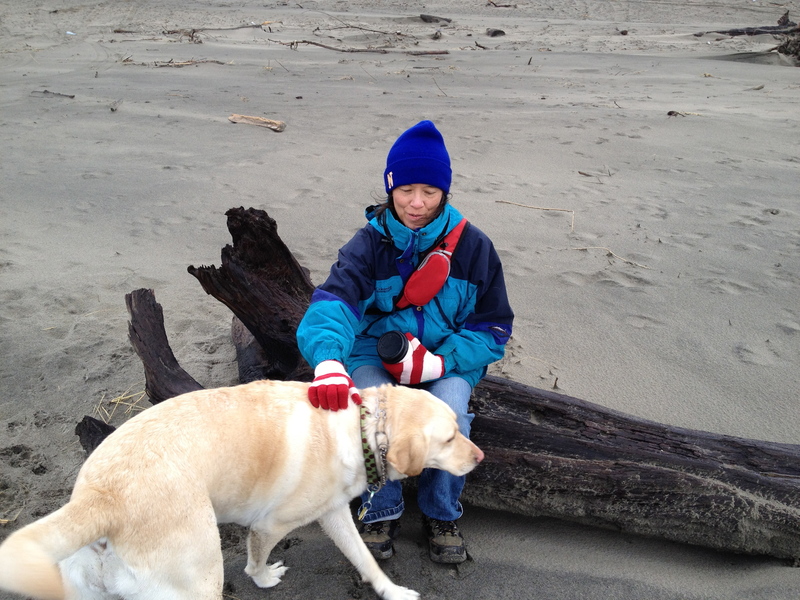 Theo and Zoie sitting on the beach at Pacific City! Theo’s week of anticipation began with me coming down with the flu last Monday afternoon. 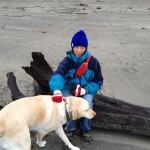 I was pretty much housebound all week and when Friday, our departure day, rolled around I was praying for enough endurance to make the drive to the coast. I actually started to shed that dreaded flu by Friday afternoon and to my surprise made the drive Friday evening without issue in spite of the driving rain we encountered while traveling over the coast range. We managed to make to the Inn in Pacific City at about 9:30 pm. 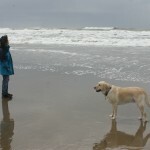 Theo enjoying the beach at Pacific City with Zoie! 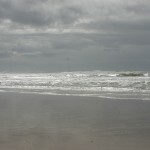 I was not expecting much out of the weekend as we were at the end of the wettest March on recorded for the state of Oregon (7.75 inches of rain total) and the heavens appeared to be trying to not only exceed the record by beat it into submission. My thoughts turned to what I might do with my 4.5 year-old labrador retriever that would be pent up in a motel room for the weekend. If you have ever owned a labrador retreater you know exactly what I mean! 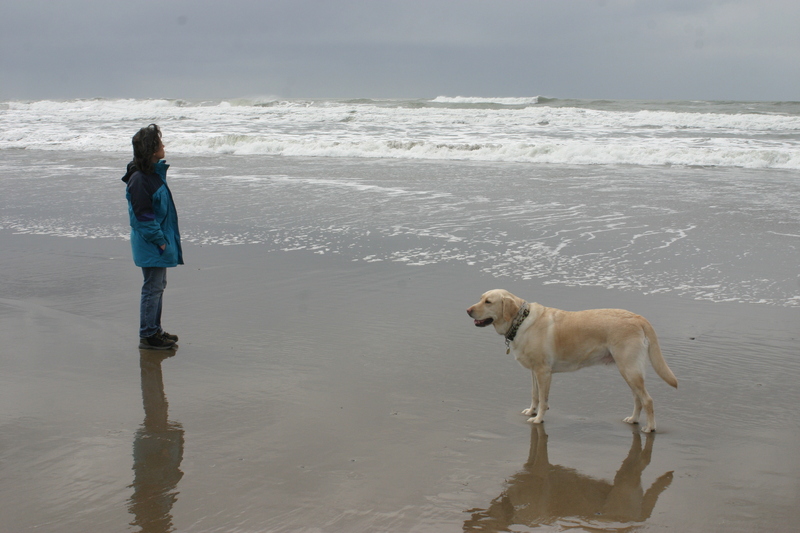 However, Saturday turned out to be a very useable day in which we managed two lengthy beach walks (the afternoon walk was actually delightful and sometimes sunny) which seemed to empty the labrador fuel cells. With our intent to relax we packed some food to make our own lunches (Theo made a wonder tuna salad spread) and were satisfied with pizza in our room for dinner (the pizza actually supplied dinner, and for me breakfast and lunch on Sunday). 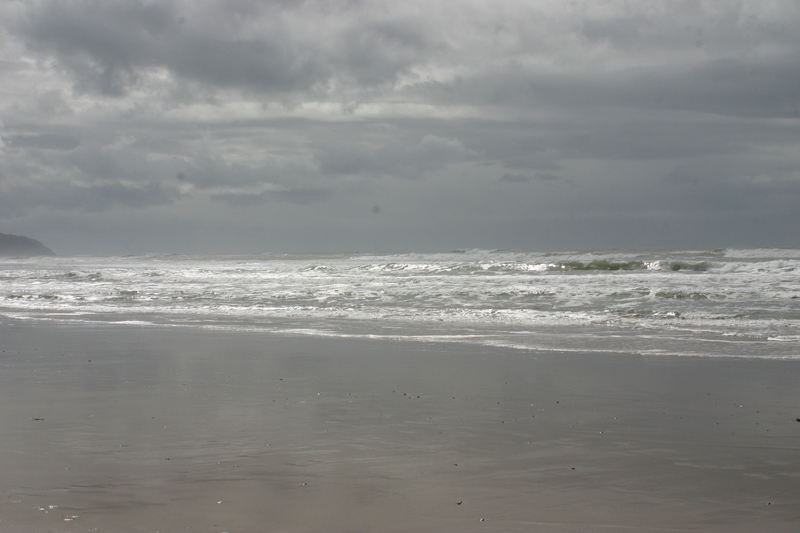 Storm clouds approaching Pacific City! Sunday was not so pleasant as winds sometimes reached gale force and it rained, rained, rained, hailed, rained, rained, and for good measure rained some more. Needless to say we just hung out in our room until checkout time at noon. Theo seemed quite content to just lay around and enjoy doing nothing…something she does not get to do often….and had to be prodded a bit to get ready to leave. When we finally checked out we drove across the street to the beach to let Zoie stretch her legs one last time before the drive home. Theo sat in the car while I bundled up to go out and let Zoie run. I started laughing when after about 5 minutes Zoie had had enough of the rain and wind and let me know clearly that it was time to get back in the van. So, Zoie and I both climbed into the back seat of the van to get out of the rain and after changing my shoes decided to climb over into the drivers seat so I would not have to go back outside. In doing so my head hit the rear-view mirror and knocked it off the windshield. So instead of going home from Pacific City we had to make a side trip to Tillamook (where they have a Fred Meyer) to by a kit to repair the mirror before our trip home. One final note. Before we left Pacific City on Sunday we stopped and did a wine tasting at the Twist Wine Company. The only other winery that Theo and I had every visited on the coast was the Nehalem Winery which as an absolute disaster. Needless to say we were not expecting much. To our surprise we were pleasantly surprised at how much we enjoyed their wines. Their wines are easy drinking, drink now sorts of wines but they are very reasonably priced (most expensive is $25) and you would not be afraid to put them on your table. Nice interesting everyday drinking wines. Below are a few photos from our weekend. If you want to see the entire Flickr album click on this link.